While it may be a good place to start, there are more ways to interact with books than simply appreciating their content, and I don’t mean using course material you’re glad to be rid of as fire kindling. Whether it be a literary classic or an illustrative journal, there’s something captivating about the physical form of a book; the way it sits in your hands, forming relationships with your senses. Is it neatly made and ‘perfect bound’? Does it have deckled edges or saddle stitching? Last term, our third-year class had the pleasure of learning to bind books by hand and were lucky enough to be taught by one of Falmouth’s very own lecturers, Mat Osmond. I’m pleased to announce it was a successful endeavour, especially considering the workshop took place the morning after various Halloween celebrations. Beautiful books were made, and no fingers were lost to the guillotine. 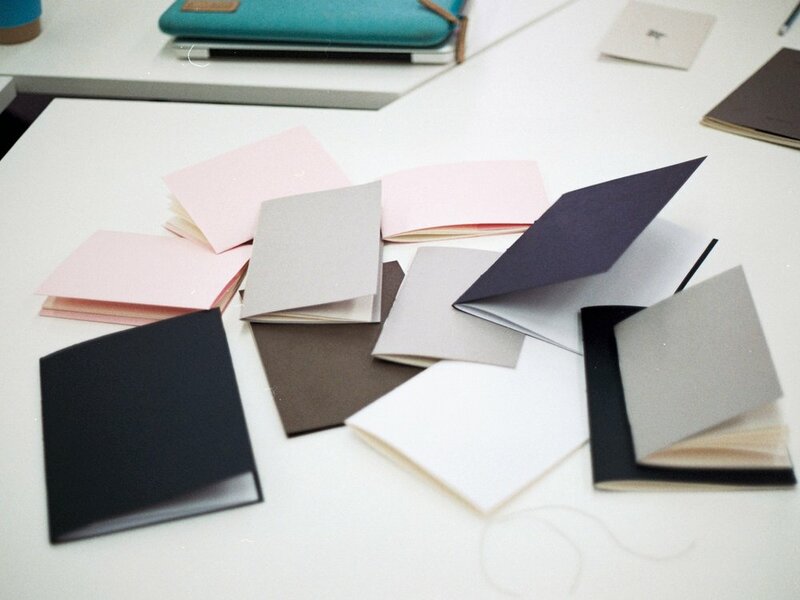 The first step was to choose paper from a small range of colours and textures for the cover and interior pages, which we then cut down to our preferred size using the guillotine. We were then set the challenge of folding and aligning our ‘pages’ by sitting them inside each other, which allowed the ‘books’ to take shape. I use inverted commas here because what I held in my hands at this stage could definitely not be described as a book, no matter how liberal your perspective. The next step, once we had skilfully threaded our needles, was to pierce the ‘spine’ with said needle. If any brave readers decide to try this at home, be extra careful to not allow the sheets of paper to move around while you are completing this step or you will end up like Dr. Luke Thompson, who (as can be seen in the images below) was somewhat perplexed by this stage of the process. Mat then patiently talked us through a basic method with which to stitch the spine. I don’t remember it exactly, but it went something along the lines of “the needle should go in and then out and then in and then round and then in again,” except it was more eloquent and sensical than that. Once the stitching was complete, we simply tied a knot in the thread to stop our books falling apart, and voilà. This experience was incredibly fun, but unfortunately, Mat Osmond is not currently available to hire out for birthday parties as he is rather busy. However, if anyone is interested in learning more about the process or trying it out in a (somewhat) controlled environment, feel free to contact Alex Horn about a potential bookbinding club, which promises to be as informative as it is entertaining. You can email Alex here. Thank you for reading, and good luck with any future bookbinding endeavours!